The third day of our Spring Break 2015 vacation was rainy and bleak, so it was a good day for me to drown…again. Every time I’ve gone to an exhibit about the infamous sinking of the ocean liner RMS Titanic, I’ve been given a card identifying me with some male passenger or member of the crew, so that I could look for linked objects and information in the exhibit and find out, near the end, if that person survived. Given that only 1 out of 5 males aboard survived, it is no surprise that every man I’ve been assigned ended up dying in the disaster. Most of my life I’ve been fascinated by the story of the Titanic going down on its maiden voyage, my interest first peaked by the 1953 movie version. It strays far from historical accuracy and concentrates its attention on Clifton Webb‘s and Barbara Stanwyck‘s troubled marriage and the story arc of Clifton’s character redeeming himself in the final hour. But that flawed film led me to Walter Lord’s great 1955 book, A Night To Remember. They say that the 1958 movie based on Lord’s book is the most historically accurate version. The best known movie version, James Cameron’s 1997 blockbuster, has impressive effects and attention to detail, but primary characters which are entirely fictional. The ship became a worldwide sensation when Bob Ballard located the wreckage in 1985. It was thrilling when, back in the 1990s, we were able to bring Mr. Ballard to Bartlesville for an evening community presentation and a talk to science teachers as part of a science teacher workshop sponsored by Phillips 66. He was a wonderful speaker, and he has long been an outspoken critic of salvaging items from the wreck. So I always feel a bit queasy about Titanic exhibits of salvaged items, although they are interesting. 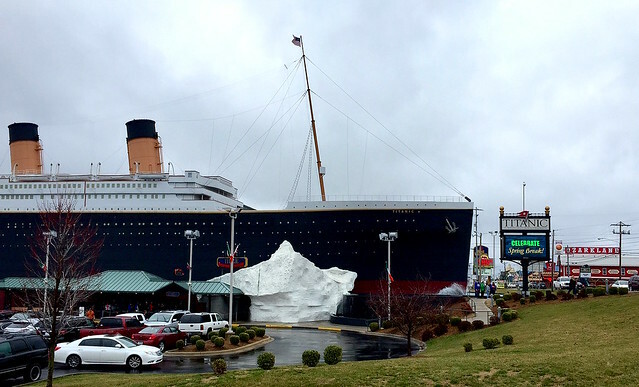 Branson has a large Titanic museum on music row, one of a few temporary and permanent collections around the country. In previous visits to this and other exhibits, I’ve drowned as a member of the crew and as a passenger. This time, Wendy was with me and got the card for a second class passenger who survived the sinking, albeit only for a year, while I was a poor third class immigrant. The moment I saw our cards, I knew the cold waters of the Atlantic would claim me while she would likely be spared; only 16% of the male third class passengers survived, versus 86% of female second class passengers. We enjoyed the exhibit and then journeyed westward along the full length of Table Rock Lake, although by car rather than ocean liner, to reach an upstream entry in the chain of lakes along the former White River: Beaver Lake in northwest Arkansas. 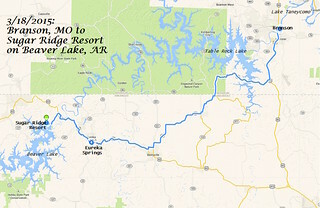 I spent thirty years of my life vacationing at the west end of Table Rock Lake at my parents’ vacation home near Eagle Rock, so I am intimately familiar with the Eureka Springs area just northwest of the lake. Last June, Wendy and I greatly enjoyed our stay at Sugar Ridge Resort on a bluff above the lake, so we returned there for the second half of this vacation. I’ve been tremendously overworked this school year by a greater number of demanding and overlapping projects than I’ve ever undertaken: school construction and reconfiguration with lots of work at BHS and science lab work at three different sites, extensive teacher appraisal system work, science textbook adoption, a $1.7 million dollar STEM grant at three different sites, and much more on top of my usual teaching load, which itself has been made harder by a new AP Physics 1 curriculum. Wendy has also had a rough year in her always-demanding work as a special education teacher. 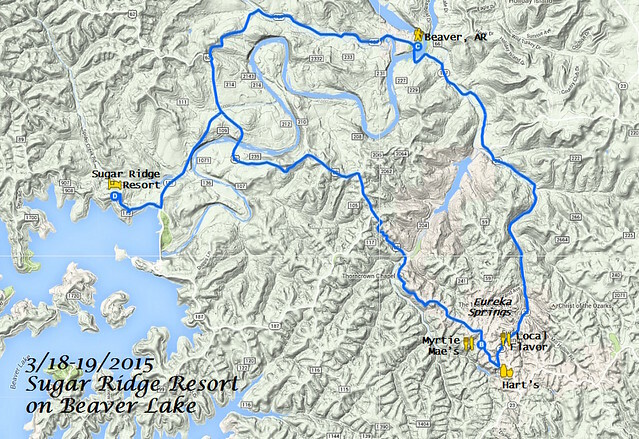 So we were looking forward to rest and relaxation at Sugar Ridge. 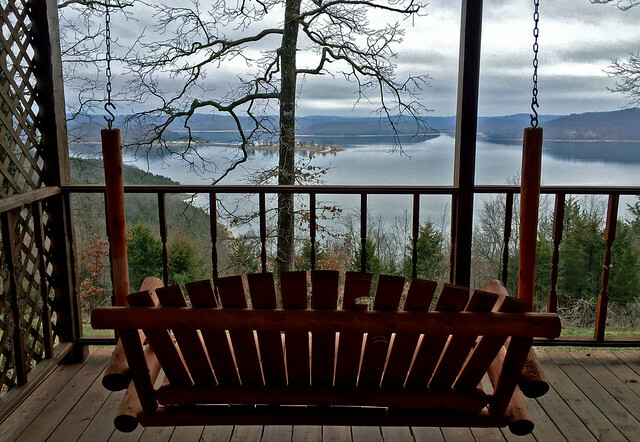 We stopped for breakfast groceries at Hart’s in Eureka Springs, and found that the lake was shrouded from view by fog and mist when we arrived at our ridgetop cabin. Dinner was at the always-good Local Flavor in Eureka Springs since Ermilio’s, as usual, had a very long wait. 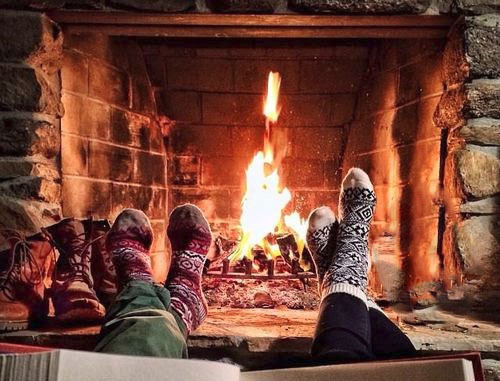 We snuggled in at the cabin for a relaxing evening, with Wendy reading to me “The Life You Save May Be Your Own” by Flannery O’Connor, while I read to her “The Last Night of the World” by Ray Bradbury and “The Recollection” by Percy Bysshe Shelley. As with our previous visit, a raccoon enjoyed the birdseed out on the deck, entertaining us when we weren’t entertaining each other with story time. Cloudy and colder weather gave Wendy and me a good excuse to relax at our cabin for much of the next day, watching and photographing birds of various species who were dining on the birdseed the raccoon had not finished off the night before. The day gradually brightened, and we finally had an early dinner at Myrtie Mae’s and drove over to Beaver town to hike the short trail along the old railroad grade for a nice 0.75 mile out-and-back stroll. It was nice to walk along the shore and through the gap blasted through the rock bluff, with reflected views of the old suspension bridge and a nearby home. Castle Rogue’s Manor loomed up on the bluff; I’d love to visit that interesting venue some day. The following and final day of our vacation would start with a nice hike on a trail new to us, the nearby Bench Rock Trail at Indian Creek.